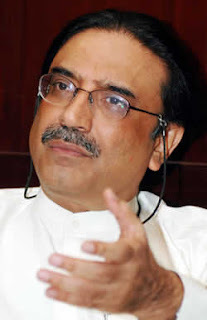 President Zardari alone is not responsible for perils faced by the Pakistan People's Party (PPP) today. Being the president of a country his personal problems are now hampering the progress of Pakistan. The problems are growing with the time and it appears to be consuming most of his waking time in meetings with so called friends and allies or political partners - time that he should rather spend on betterment of people of Pakistan who are stuck in a country where the quality of rulers seems to be dwindling with each successive government as Father of the Nation Mohammad Ali Jinnah predicted before his death in 1948. But could Zardari alone be held responsible for the current plight of PPP or does the entire PPP leadership carry the blame? There is no doubt that luck played a big part in Zardari’s ascent to power. It clearly was a very difficult period in PPP’s history after the party was left devastated by the loss of its all powerful leader, Benazir Bhutto . Also there is this traditional style of ascent to political leadership in the subcontinent where a single person becomes the face of the party without whom nothing seems to matter. For this reason the senior party leadership thought that they needed a figurehead in the form of Zardari, being father of Benazir's children, to carry on that legacy. This was understandable logic at the time but the leadership had a much bigger and wider role to play. The party leadership should have been able to see outside the box and should have able to imagine the ramifications of Zardari’s candidacy which they approved on his flimsy evidence. Evidence that Mr Zardari refused to share with the public to whom they owe everything, who have made them the “leaders” they are. The traditional style of thinking and jumping on the band wagon without proper assessment would have normally worked in Pakistan only if the candidate in question was a normal first husband. The man in question was, however, no other but Mr Zardari and the party leadership failed to recognise the extent of the baggage he carried and his capacity to be ever able to emerge from those shadows. The PPP Central Executive Committee was witness to the fall of its government on two occasions and on either occasion Zardari’s corruption was blamed for it. It is only fair to expect from members of CEC that they would have been capable of such risk assessment and its management. They failed dismally on both counts. Before making a decision on a new party leader the senior leadership should have carried out wider discussions over many days involving all stake holders instead of a two hours meeting just two days after the death of a cult like personality Benazir Bhutto. The question in consideration should have been that in Pakistan where a party chairman is a supposed to be a visionary personality who leads his/her party to success and glory wcould Zardari be that person or would he become a liability for the party because of his past and that whether that damage would be sustainable. Secondly once they had agreed to his ascent to power there should have been a comprehensive strategy development exercise aimed at enhancing his stature to such a point that effortlessly appeared convincing to the masses. This should have been possible by putting together a governing team without a blemish on their character that executed political programme that uplifted the lives of masses. Quite to the contrary the party made mistakes after mistakes refusing to accept the consequences. The party somehow convinced itself that as they had accepted Zardari so will the masses and all other stake holders. They failed again to recognise that whereas they had a personal interests in selecting him but other stakeholders did not. And to be fair to other stakeholders including Pakistani public, PPP political allied parties, opposition parties, judiciary, agitating lawyers, establishment and media time and again gave Zardari and the PPP benefit of the doubt. But time and again Mr Zardari faled all of them by breaking political promises and agreements. The CEC, that “expressed full confidence in Mr Zardari” after each political disaster, should have foreseen the consequences that such behaviour invited and should have stood up to his style of governance. As Mr Zardari’s political behaviour became more and more erratic and unpredictable the CEC only concerned itself to repeatedly reposing its trust in him leaving people shocked and hopeless. repeatedly not to recognise right from wrong? How do they not feel guilty by always giving in to such demands and not thinking of the impact of such decisions on scores of people? How dare they insult the intelligence of Pakistani public by endlessly arguing in favour of their repeated betrayals of Pakistan and its public on electronic media rather than hiding behind walls. For it is Pakistan that made them who they are today and without it although they might have palaces in different countries around the world but will have no identity. PArty leadership's decision about Zardari leadership has seriously wounded the party and it is now time for the CEC to make its mark. The senior leadership needs to come out of Zardari’s shadows and play an active role in steering the country out of this situation. Without further delay they need to strongly support and implement some long awaited and popular demands like the restoration of constitution, rationalising the cabinet and take strong measures against corruption. If Zardari is stubborn enough to continue to disregard the senior leadership and treat them like hired managers of a private business then they need to reflect that rather than humiliating themselves on daily basis by making vain attempts to justify his selfish blunders is it worthwhile to resign from CEC and live like decent men with their heads high rather than govern with a bleeding conscience.